Disclosure: The Chicken Soup for the Soul: The Multitasking Mom’s Survival Guide listed below was provided for me in order to facilitate my review. All opinions are my own and honest. I am disclosing this in accordance to FTC Guidelines. Please see “Disclose” tab for more information. I absolutely love reading books. I have been a fan of the Chicken Soup books since I was little. I am so excited to be able to offer 1 lucky reader a chance to win this great book! Mom’s are the busiest people in the world! They juggle kids, husbands, jobs, housework, and more. This collection will inspire and entertain masters of multitasking with its 101 stories from busy moms like them. Filled with words of wisdom, lessons learned, funny moments and juggling success, this book will brighten any Mother’s day. I was a big fan of this great book. It is so nice to hear that some of the craziest experiences that I have had written by someone else who has also experienced it as well. I think that Chicken Soup books share so many great stories with others. I know that they provide words of encouragement as well. This Multitasking Mom book has a ton of great stories. I love to read stories about other people and ones that truly apply to my life are even better. 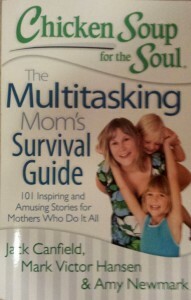 1 Lucky winner will win a copy of The Multitasking Mom’s Survival Guide. I think the Chicken Soup for the Soul: Just for Teenagers would be a good book for my son to read. All kid entering their teens have a lot of tough decisions to make about school, friends, family and peer pressure. This might be able to give them some good tips and pointers.